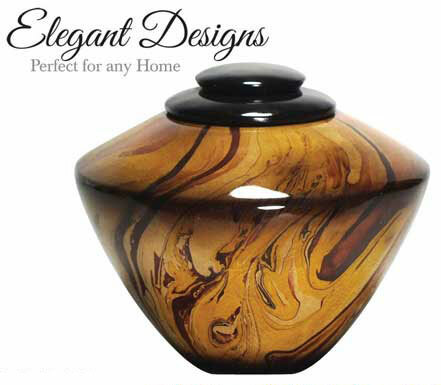 This round urn features a marbled design and a matching lid and foot. This keepsake matches the Disk Marbled Urn and allows for multiple family members or friends to keep a loved one close. The Cerulean, Royal, and Scarlet Marble Urns are crafted of genuine brass with a spun finish and is a hand painted urn in a pleasing marbled. 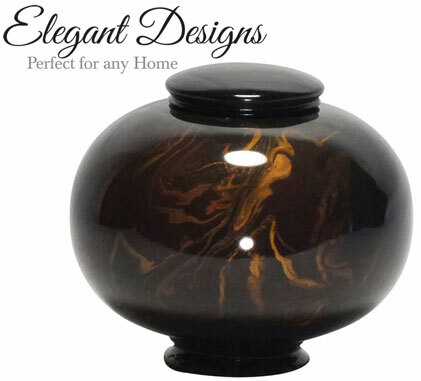 Measures 12 1/2" x 8"
Our Pearl Onyx is our highest quality urn. Finished in a rich onyx, this urn is sure to impress, holding up to 230 C.I.11.3" x 7.9" x 7.2"
Available in White, Black or Stone. 11" x 7.8" Dia. The Heaven's Light Urn is perfectly sculpted cut and polished from the earth. These imported warm, cream colored marble urns have a soft sweeping shape up to the ceremonial candle shape, that offer comfort. They are a beautiful a work of art. The Round Marbled Urn has a matching Keepsake. The Sublime Cerulean Urn is perfectly sculpted cut and polished from the earth. These imported white urns have been tinted with a unique and exclusive process that creates a beautiful marbled urn. From earth and man's hand, this urn is an artisan's work of art. 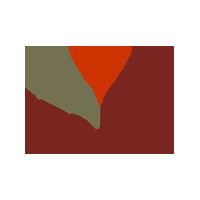 The Noble Red Marble Urn is perfectly sculpted cut and polished from the earth. These imported white urns have been tinted with a unique and exclusive process that creates a beautiful marbled urn. 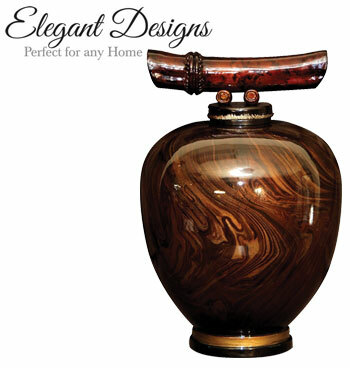 The Imperial Ebony Marble Urn is elegantly crafted from solid marble with pewter feet and a decorative lid. Natural variations in the stone assure each piece is 100% unique. The Pride's Father Marble Urn displays a delicately carved lion statue guarding the resting place of your loved one. Natural variations in the marble make each urn unique.